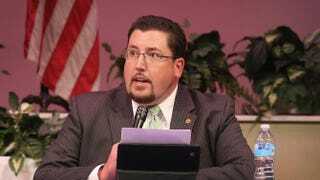 Mayor James Knowles presides over a City Council meeting Sept. 9, 2014, in Ferguson, Mo. As the nation awaits a grand jury decision in the case of Ferguson, Mo., police Officer Darren Wilson, who shot and killed 18-year-old Michael Brown on Aug. 9, Mayor James Knowles sat down with Al-Jazeera America Monday to try to clarify the assertion he made months earlier that “there are no racial divides” in Ferguson, Mediaite reports. What Knowles meant, he explained, was not that there were no racial divides but that any divide in his community was the result of socioeconomic factors. While he acknowledged that black residents of the town have “a different life experience in general than a white resident probably does,” he insisted that the stereotypical racial tensions don’t play out in Ferguson. “We do not see white residents and African-American residents looking at each other with a cautious eye or scared of each other on a daily basis,” he added. In a transcript provided by Al-Jazeera America, the mayor said that he regretted his comments because it was a difficult argument to have, but once again insisted that “those differences [don’t] mean this community didn’t have good race relations before this happened,” referring to Brown’s death. Read more at Al-Jazeera America and Mediaite.